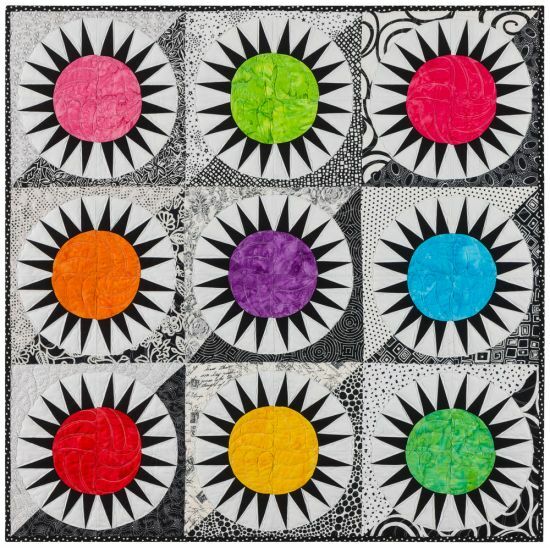 Roxbury Rainbow (New York Beauty Electrified) from Frog Hollow Designs by Linda Hahn. Quilt patterns and kits. A new twist on Linda's technique for quickly and easily making New York Beauty blocks. This entire block is pieced - no applique. Students just love Linda's method for foundation piecing the arcs. You'll have this dynamic design stitched up lickety split! This design has "split backgrounds" (two colors) that require a bit more (though not much) precision piecing. Linda makes it a breeze! Required Kit - $28.00 includes re-useable paper piecing stencil, custom acrylic templates and foundation paper (that can be left in the quilt).